Waterproof tree wraps not only direct customers to the right tree category to help them narrow their search, but also protect young tree trunks from damage on the way home. Color coded to steer customers to the right trees at a glance. 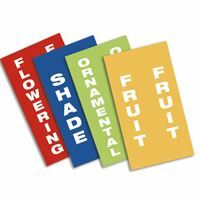 Select from Flowering, Shade, Ornamental, and Fruit categories. Wraps are 10" wide by 18" tall and come with a strip of double sided tape on one end to wrap tree trunks up to 4" in diameter.